I'm not your common, everyday twenty-something year old and when I graduated from High School I got an equally uncommon gift. My parents found for me a beautiful 1940's mink stole at a garage sale. It had belonged to the woman's Great Aunt Betty who had married late in life to a man with money and had only allowed him to buy her this one luxury. The unusually styled stole has the name, Betty L. Jones, embroidered in the satin lining so that's what I call her. They never had children of their own and the mink was passed to Aunt Betty's niece and on to her daughter. Until it got to me, no one since Aunt Betty had worn it. Now Betty the mink and I go to the theater together on special occasions and I hope that someday I can take her to the Symphony or the Ballet. 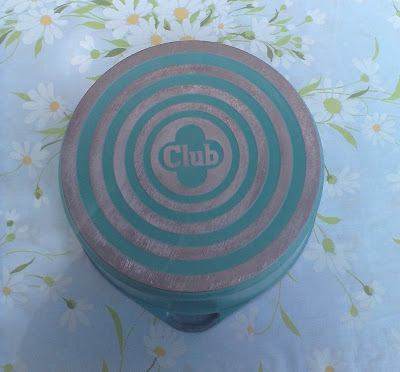 Although Betty hadn't been worn or loved for many years she was waiting for someone to love her again as are most other things I look for when thrifting. Today I am sharing more estate sale finds from last year. These are from an estate sale Mom and Dad went to last fall. Once again I was working. The sale was just a few streets over from our house. When they got there, people were lined up down the block. 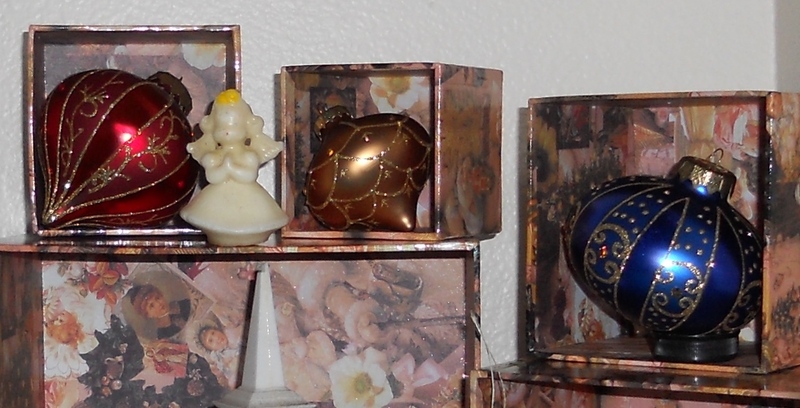 Apparently the lady of the house was an avid doll collector and there were hundreds of dolls. They almost gave up and went home, but then figured that if everybody else was there for the dolls, maybe there would be less competition for the things they liked. They waited in line for about 25 minutes and this is what they took home. Not a lot, just mostly useful stuff: bamboo skewers, glue sticks, plate holders, frames, etc. They found a couple of jello molds. Because I don't have enough, right? I actually gave the smaller mold away to my friend for her kids to use at the beach. You can make some pretty cool sand castles using jello molds. and plenty of room for thread. They also found my thread holder of choice. It's a vintage Tupperware bacon keeper. I have 4 or 5 of them. They stack and they travel well. 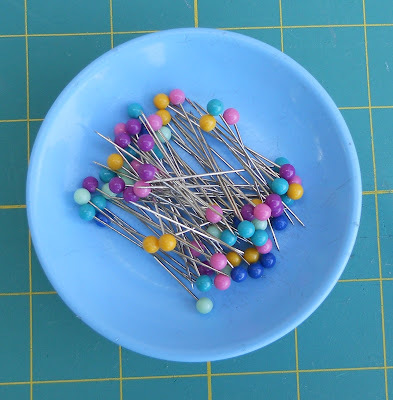 They won't open up or spill easily, and all the colors are on display and easy to find. If you sew or know someone who does, I highly recommend buying these when you see them. 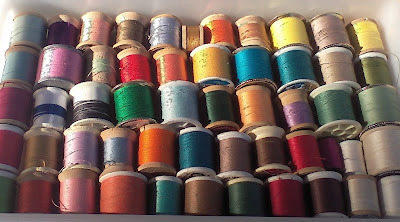 This one was 75c (empty, of course - spools added later). 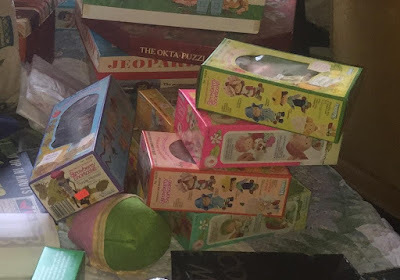 The doll collection was so big that they ran another sale the following week. Mom decided to avoid the crowd and go on the last day of the sale. She found a few things that other people missed. I love this nifty little gadget. 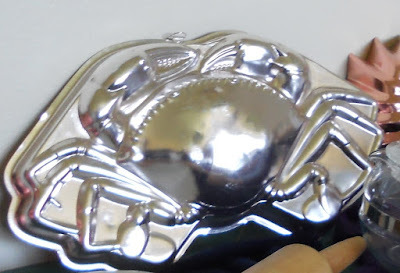 It's a Grabbit magnetic pin well. 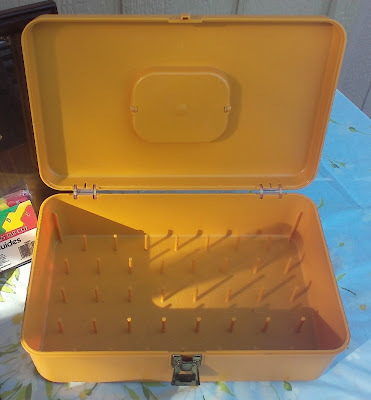 I'm sure most of you have seen magnetic pin wells before, as DIY versions are all over the internet, but they had escaped my notice until Mom found this one. Mom knows how much I love tins AND peacocks, so she couldn't leave this tea tin behind. Isn't it gorgeous? My picture just doesn't do it justice. Mom was very happy to find this colorful Chinese Checkers game. 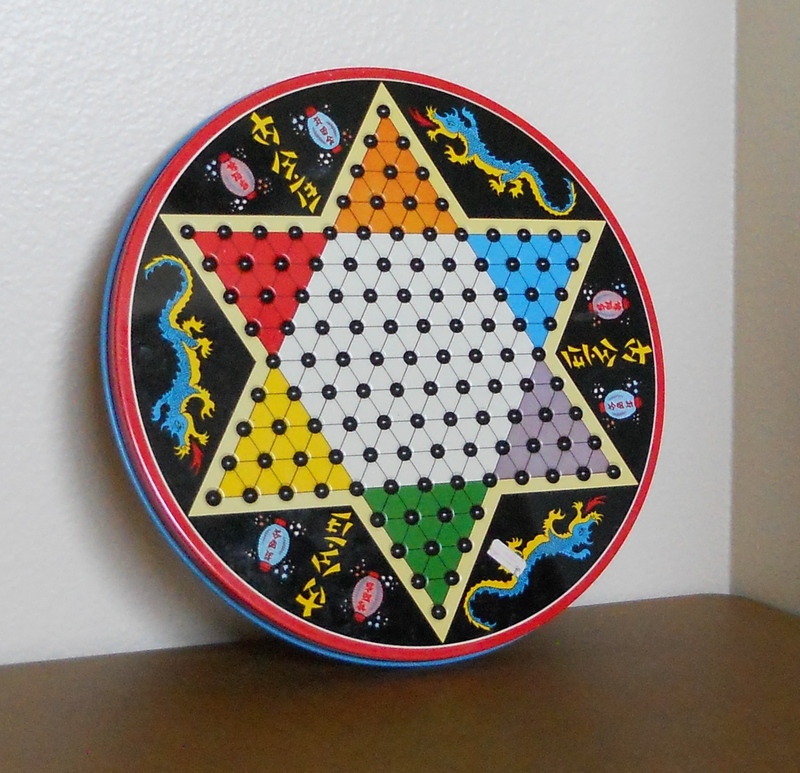 Chinese checkers was a favorite of hers when she was very little. 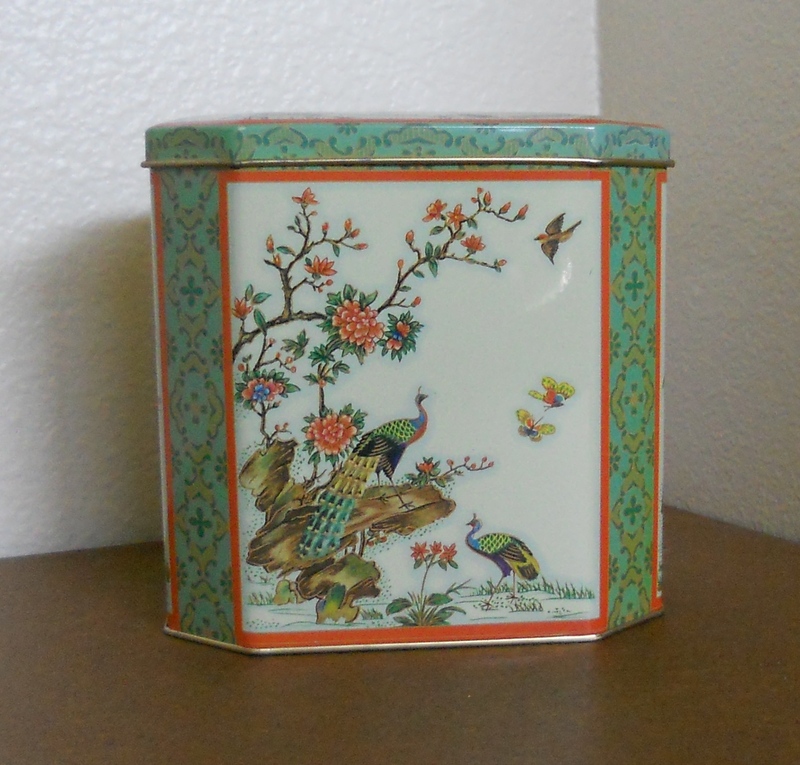 This large tin was made by the Ohio Art Co. sometime in the 1960s. I just love the fire-breathing dragons. On the backside is a checkers board. 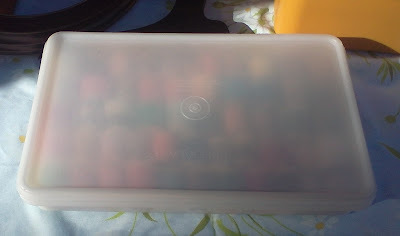 The playing pieces are supposed to be stored inside the tin. Unfortunately, the tin is extremely difficult to open, which must have been frustrating for anyone wanting to play. Perhaps that explains why it is in such great condition. The marbles are missing, but it will still look great hanging on the wall. By the way, Chinese Checkers is neither Chinese nor checkers. The game was invented in Germany as Stern-Halma. When it was published in the United States by J. Pressman & Co, they thought that associating it with the familiar game of checkers and giving it an exotic Chinese theme would make the new game more marketable. 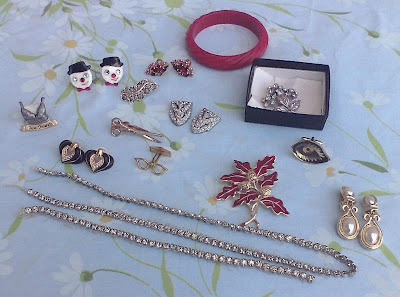 I still haven't haven't been able to get out and do any thrifting lately, but I brought home a lot of stuff last year that I never posted about, so I'll show some of it now. I know, lousy picture, but we're going back in time, so everything's supposed to get a little fuzzy, right? 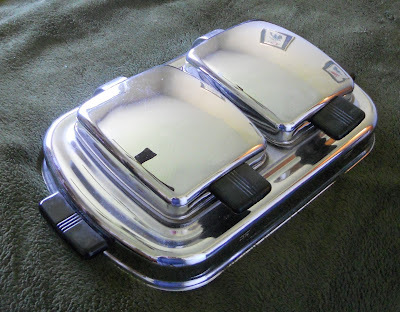 As you can see, I've acquired a few more aluminum jello molds. Do I need more jello molds? Plus they're a heck of a lot cheaper than rhinestones. I especially like the one with the roses. I had been looking for one like that for a while, so was happy to see it at Goodwill for half price - $1.50. The two copper ones were garage sale finds for 50c each, much more my speed. Have I mentioned I'm cheap? How could I pass up this giant crab mold? It's both ridiculous and fantastic. It's a whopping 14 inches across. I had never seen one like it. I couldn't even find a picture of one online. And for once, the Goodwill price was a shockingly reasonable $1.99. I'm still looking for the lobster. The next two finds were items off my thrifting wish list and I found both of them at Goodwill on the same day. 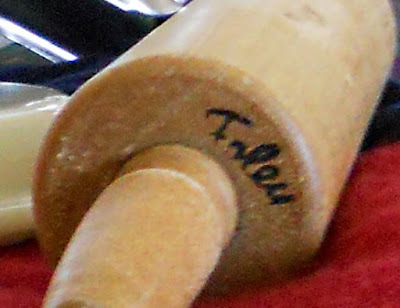 This is a Foley rolling pin. My mom has one, and I've wanted one of my own forever. What's so special about them? 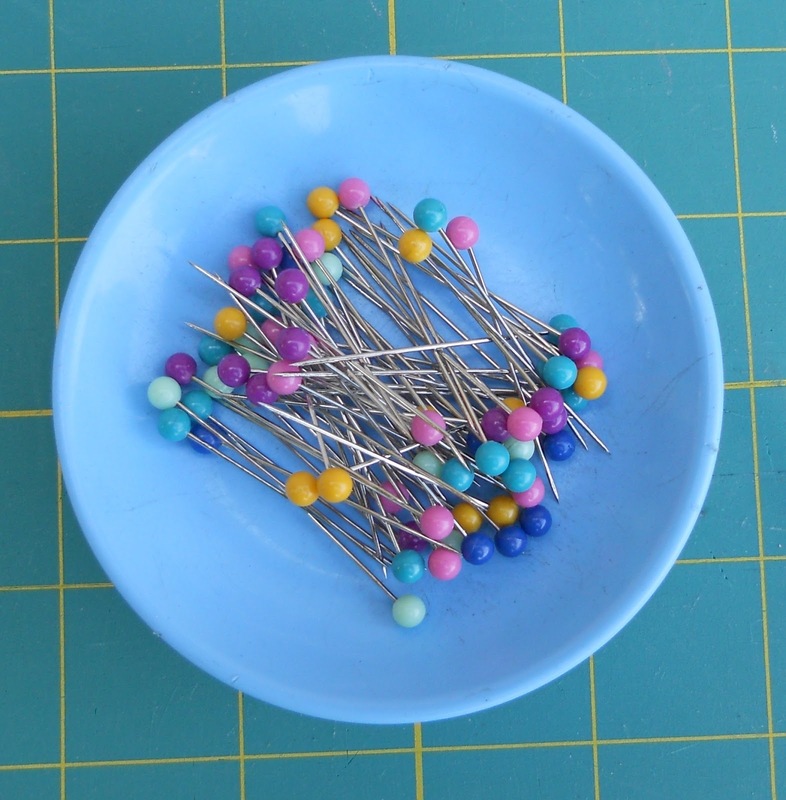 They have ball bearings, so they roll very smoothly, and they're built to last. 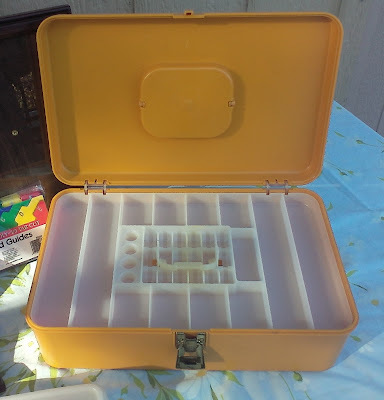 I've seen other brands at estate sales, but they were never as nice as Mom's 40 year old Foley. Goodwill price - $3.99. Recognize this little piece of loveliness? 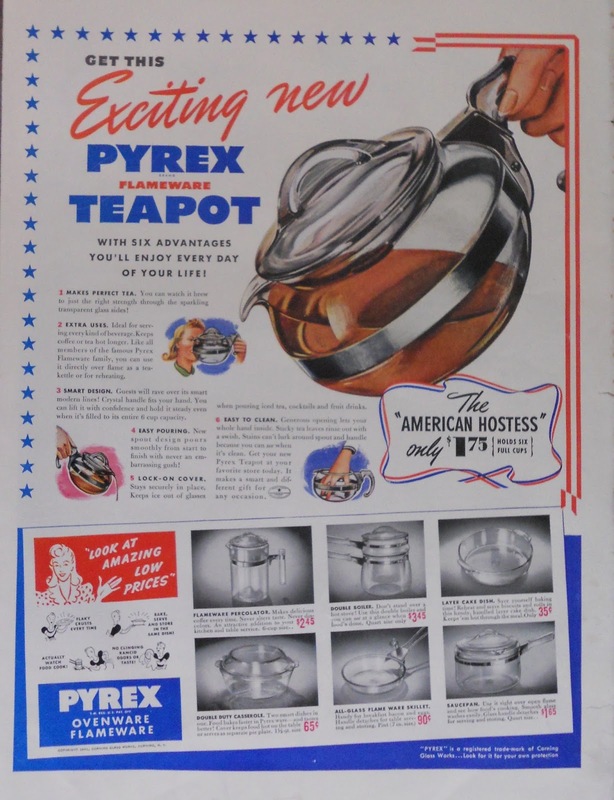 It's the Exciting new Pyrex Flameware Teapot! 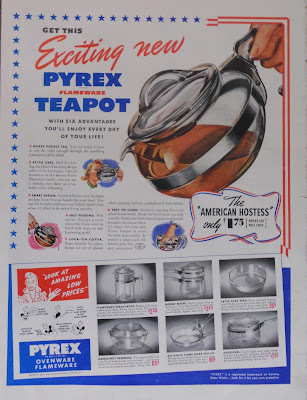 Some of you may remember this 1941 Life magazine ad I found last May. 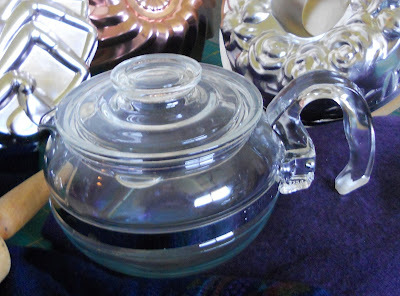 I happened to go to Goodwill the very day they put the teapot on the shelf, and I snatched it right up. I didn't even blink at the $7.99 price tag. Usually I think their prices are crazy. But I guess that day I was crazy too. Pyrex crazy. It's a thing. 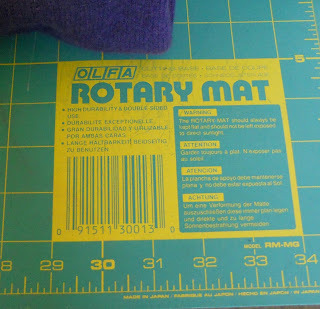 I found this cutting mat at Goodwill last summer also. It was in pretty rough shape, with two large splits and some staining, but it was really big (23 x 35 inches), so I figured I could salvage something from it. 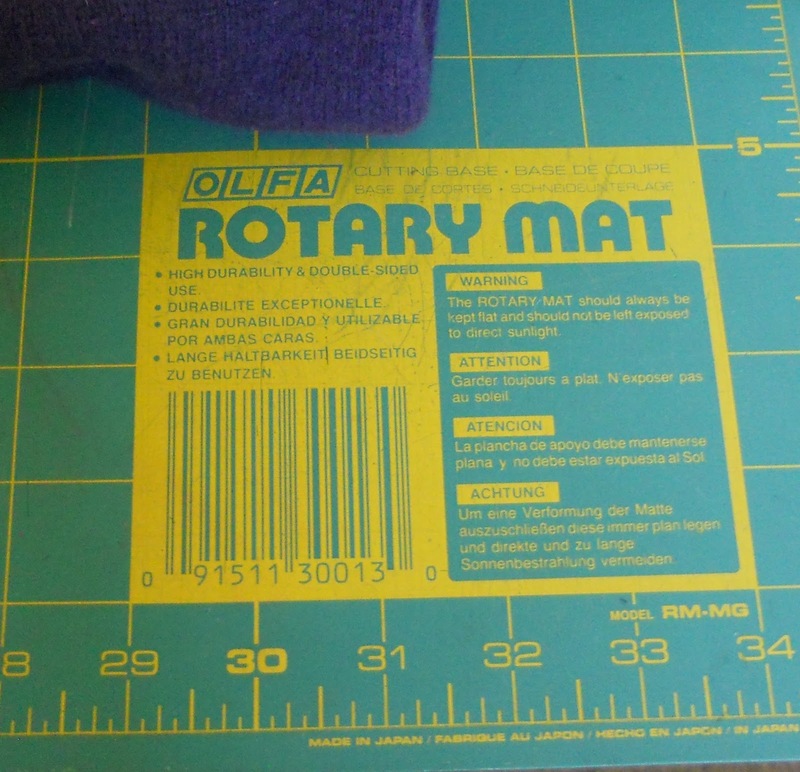 A new mat of this size costs over $50, so I paid the Goodwill price of $1.99. I thought I would cut it down into smaller mats, but I ended up putting some duct tape on the back and using it as is. I still want a new mat, but I'll have to save my pennies. 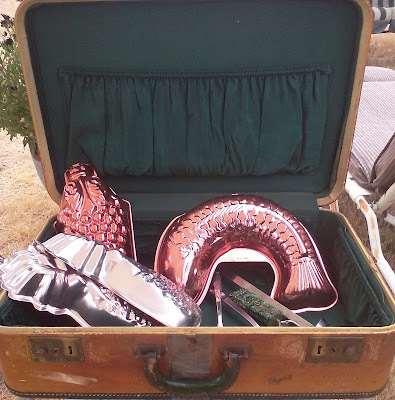 I went to a garage sale with my folks one Saturday. Two 50c sweaters for unraveling; 1 wool, and 1 wool/cashmere/angora. The 25c colorful wool hat will make some really fun felt. 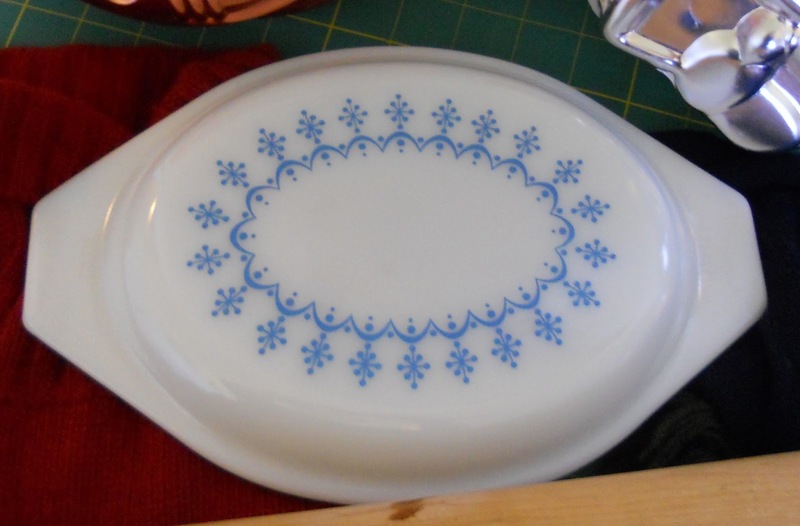 These Pyrex casserole lids were free. I couldn't let them go to the landfill. Someday I'll find a casserole to put them on. 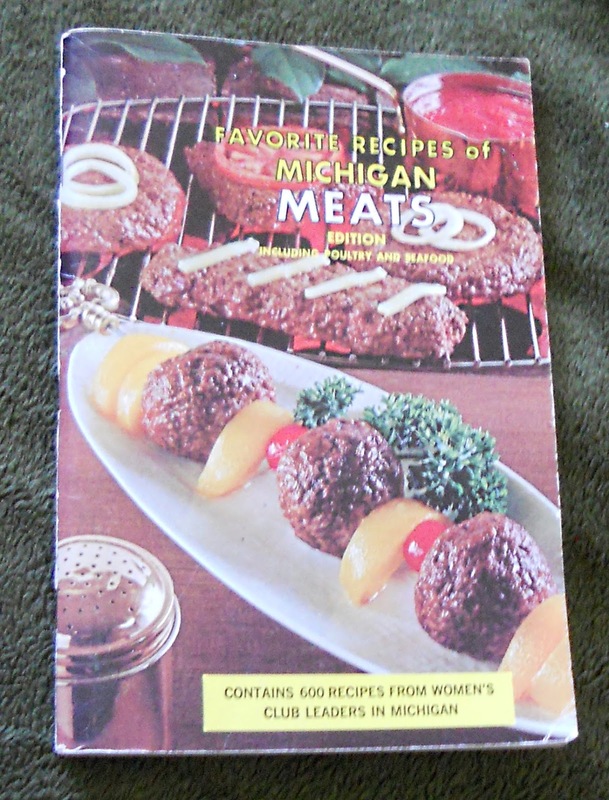 Mom bought this cookbook for 25c, mostly because Dad's favorite meal is meat topped by meat with a side of meat, but also because it has a recipe for Roasted Raccoon. She says it goes with her Community Center Cookbook from North Dakota that has the recipe for Jake's Muskrat Stew. It works, but I don't know if I'll actually use it. It gets awfully hot, so you have to be careful, and I wouldn't want to ruin the chrome. I just like looking at it. The lady who was selling it said it was a gift to her daughter from a boyfriend. When they broke up, she didn't want it anymore. I guess she didn't want any reminders. I paid $7.00. Thanks so much for stopping by my blog. I hope you've enjoyed today's post. I haven't posted in a while because Mom had another surgery and I have been helping her with her recovery. She is completely recovered now, and I have a new job that is keeping me very busy, but I didn't want to miss wishing you all a Merry Christmas. 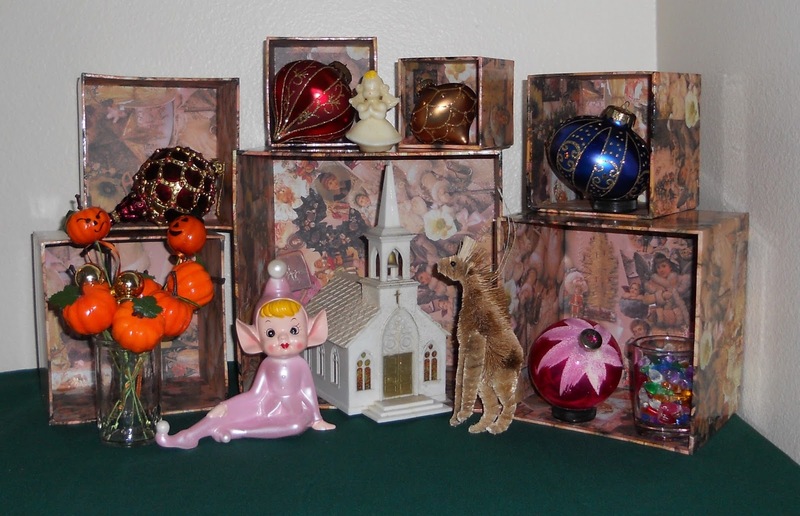 I haven't been able to get to any sales recently, but I have picked up a few Christmas items throughout the year that I would like to share with you. 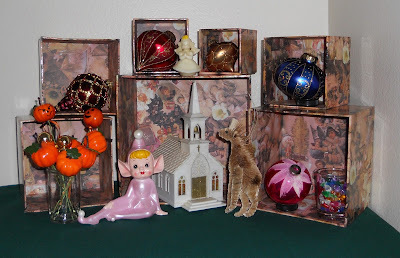 I found these Victorian Christmas nesting boxes at an estate sale. I thought I was buying three boxes, but there turned out to be seven. I paid $2.50. 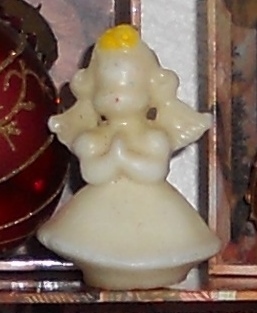 The fancy glass ornaments came from the same sale for 50c each, but I rescued the Gurley Christmas Angel from the bins at the Goodwill Outlet. She's a little worse for wear, but she's my only Gurley, and she's probably over 50 years old, so I think she's lovely. 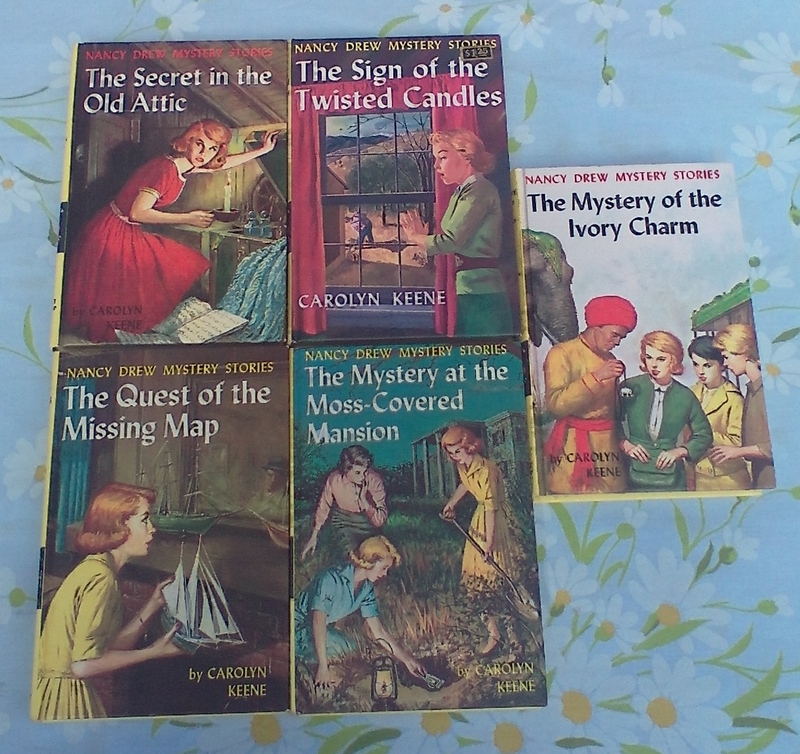 She cost all of 10c. They had quite a few very nice sisal animal ornaments at the estate sale, but they were marked $2.00 each, so I only chose one, the giraffe. When I went to pay for him, it turned out they had marked all the ornaments down to 50c, but it had been a long day at this particular sale and I was ready to go home. 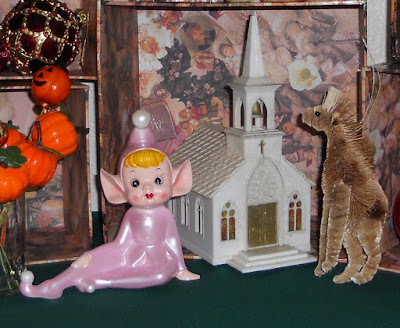 I found the elf at a small thrift shop marked down to 50c because she has a small chip on her left hand where her thumb would be. She is still the most glamorous elf I have ever seen. She is a gift for Mom. 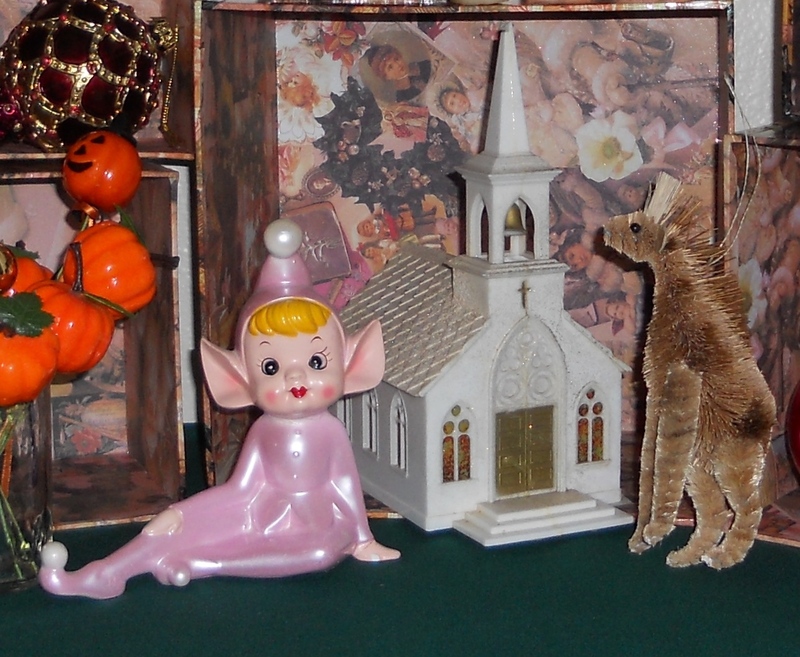 Speaking of gifts, Mom found the plastic church at the Goodwill Outlet for 43c and gave it to me. I have plans to make a Putz house village and it should fit in nicely. The very tip of the steeple is broken off, and it used to be glued to a base, but all the cellophane windows are intact! I'm thrilled to have it. 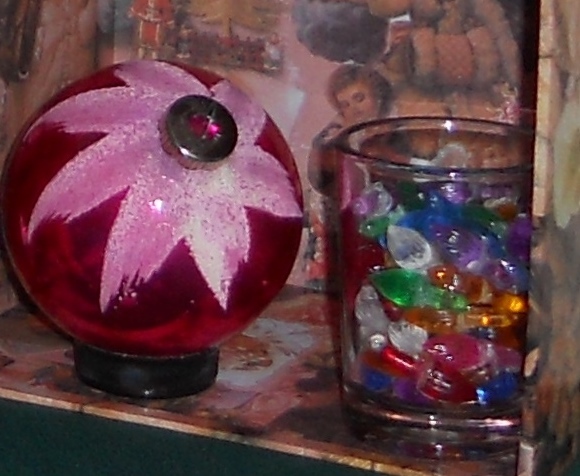 The pink ornament is a Shiny Brite and I think it's the largest I've ever found - 3.5 inches in diameter. I have been hoping to find an affordable ceramic light up Christmas tree, so when Mom found one at the bins, she was very excited. It turned out to be broken beyond repair, but she rescued the lights for 20c. If I ever find that tree, I'll have plenty of replacement bulbs, lol. Christmas isn't the only holiday I've thrifted things for. I found the pumpkin picks at the bins for 14c. The jack-o-lanterns are very cute. 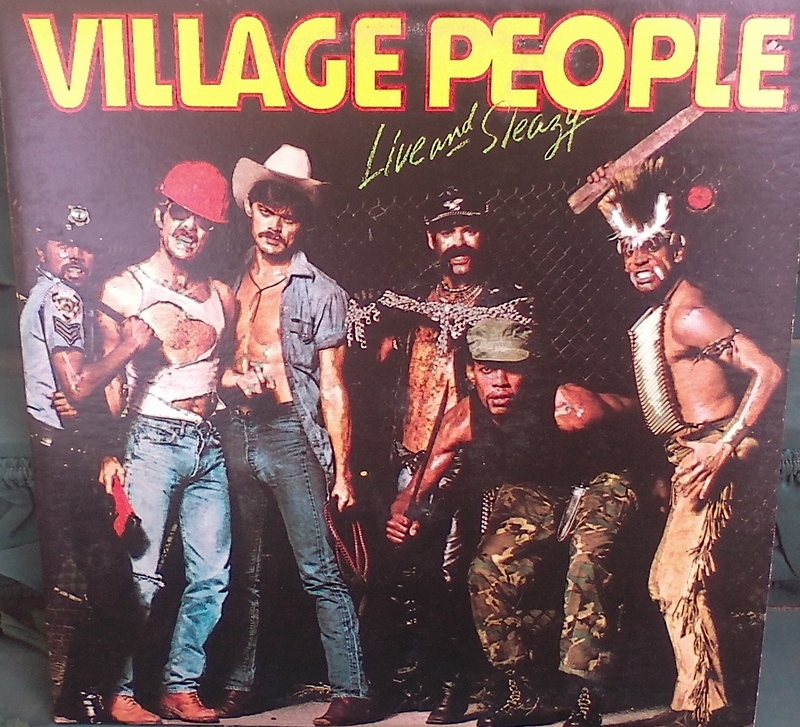 This is one of Mom's favorite Goodwill Outlet rescues of all time. 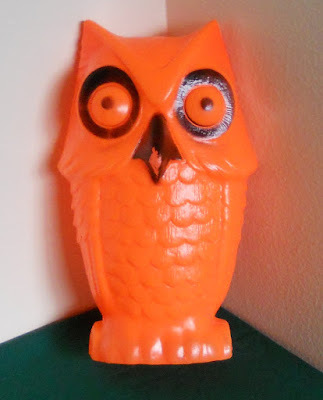 A Halloween owl blow mold lantern. It is missing it's cord, but that should be an easy fix. They sold on Ebay this year for around $30. Mom paid 69c. After he's fixed. we'll hang him in our craft room. I hope you have all enjoyed my blog this year. Thank you to all who have taken the time to visit and a special thank you to those who are kind enough to leave a comment. May you all have a truly blessed Christmas and much joy in the coming new year! As I said in my last post, August was a great month for Estate Sales. 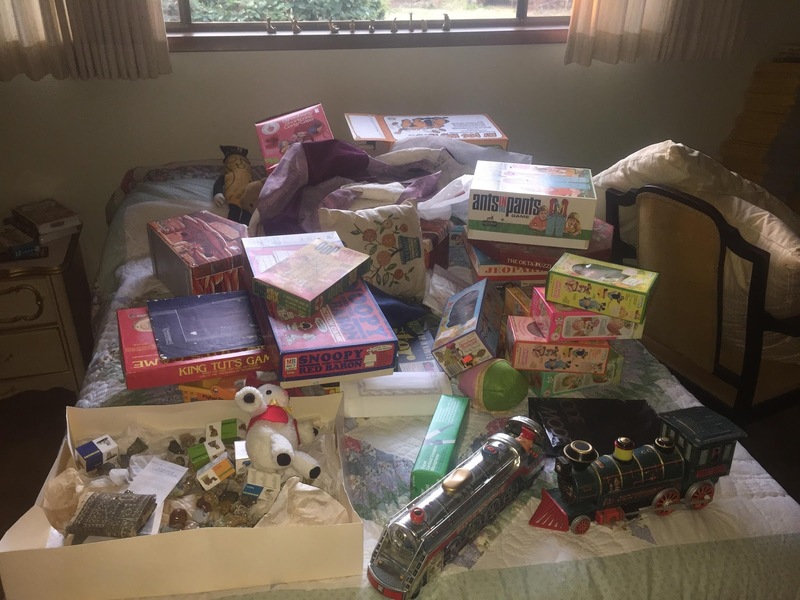 It was the second week and I was looking at pictures online of upcoming sales when I spotted something in a picture of a bed covered in toys. 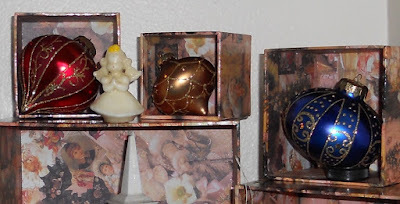 It appeared to be a box containing a Strawberry Shortcake doll from the 1980s. I received a Strawberry Shortcake Doll House for Christmas back in 2011. You can read about it here. I still don't have many dolls (despite being very much in love with Strawberry Shortcake), so you can imagine how excited I was to see one at a local sale. while another was definitely Cherry Cuddler, both of whom are high on my wish list. I know this means nothing to you unless you are also a Strawberry Shortcake nerd, but to me this was very exciting. But wait, was there any chance that I could actually get my hands on those boxes? 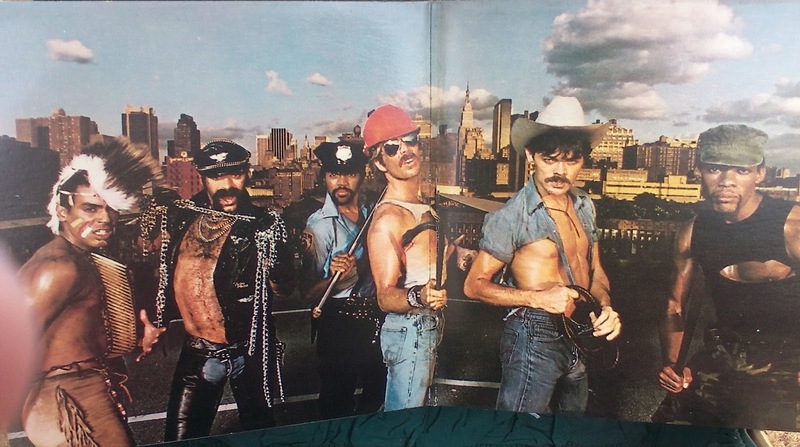 These babies sell for big bucks on ebay, so I would have to beat the dealers to them. I checked and they weren't on the list of items that were for sale, and you could hardly tell what was in their awful pictures. That was a good sign; maybe nobody else would be looking for them. There was no sign-up list to worry about. All I had to do was be first in line on Friday morning. There was also the question of price, since I have limited funds, but I hoped they would be reasonable and I could get one or two of them. If nothing else, I wanted to at least see them. So I called my friend Wendy and we made plans to go. I wasn't able to be the first in line as we had a few errands to run that day but I was hoping I might be able to find them anyway and at least see them up close. That sale was a mess. The house was huge and things were just all over the place with very little apparent efforts to organize anything and few marked prices. After searching through the entire house (basement including bedrooms, kitchen, living room, study, 4 bedrooms upstairs and a few bathrooms) I finally found the room that had the train from the photos. But the bed was now covered in clothing and the dolls were nowhere in sight. There was just the box for a Berry-Shaped Carry Case (which I own several of) but no dolls. Everything was just so disorganized. I wanted to ask someone in charge if the dolls were still around somewhere but I couldn't find any workers in the house. I found this bedspread in one of the last bedrooms. 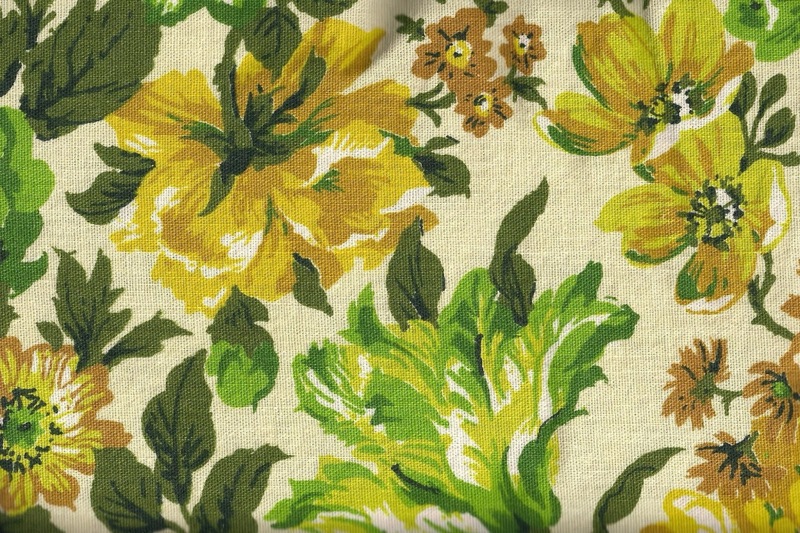 Doesn't it remind you of the curtains from The Sound Of Music? There is plenty of fabric and I'm quite excited to turn it into a gathered circle skirt. 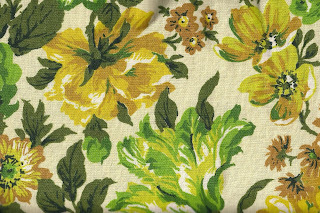 The material is standard woven curtain type fabric that resembles canvas and I'm hopeful that will mean a skirt that doesn't need a crinoline to look full. We also saw a blonde mink stole that I was very interested in until I noticed a large hole between the lining and the fur of the collar so I sadly left it behind. I asked for a price for the bedspread and was quoted $3 which I deemed acceptable because of the low price on the jewelry. I also asked the woman in charge whether or not the Strawberry Shortcake dolls had sold and if she could remember what they were sold for. She didn't remember them. It was so weird and kind of frustrating as I just wondered, (maybe if she didn't remember them, that meant they didn't sell for a very high price) but I wasn't about to search that whole house top to bottom again. My parents also went to the sale on Sunday. 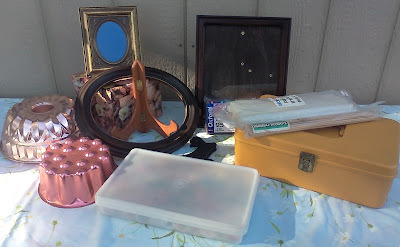 Usually the last day of an Estate Sale everything under $50 is half-price, but half-off no price is still no price, so it was hard to tell. 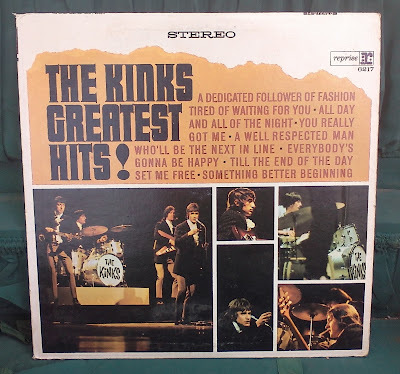 After they had found a few things that interested them, they had a question about price, so Dad trudged back upstairs and went outside where BOTH of the people running the sale were located and requested a price. He was met with the response of "Is that all you're buying? Show me everything you want and I'll give you a price on all of it." What the heck? No individual prices? How do we know what we want to buy if there are no prices? We're not antique dealers. We just want to find a few nice things we can afford. Frustrated, Dad left the item with the cashier for safekeeping and went back to Mom. They looked around a little more, and when they got back to the kitchen, there on the table was the item that Dad had given to the cashier for "safekeeping." AARRGH! By this time they had had enough of these "professionals" and were ready to leave. plus this 4 Qt Turquoise Club Aluminum dutch oven. 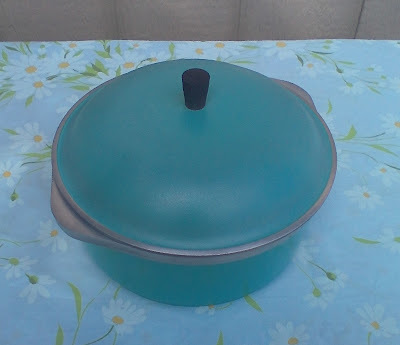 The dutch oven was charred black all over as if it had been used in a campfire, but Mom put it in her biggest pot, added a scoop of dishwasher detergent and boiled it for about 30 minutes. After that the grime just wiped off. 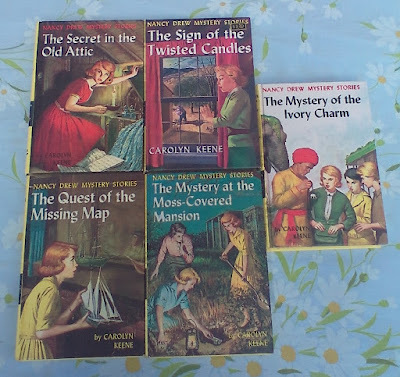 I don't think these Nancy Drew books from the '60s have been read even once, their pages are so tight. I love the illustrations on the facing pages. The iced tea spoons are silver-plated. 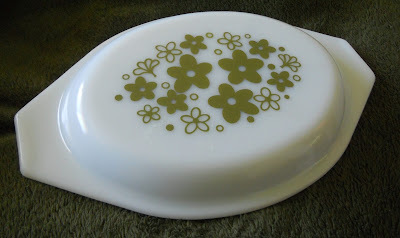 We see the Fire-King relish dish often, but never with all it's gold leaf edging intact, so Mom couldn't leave it behind. The creamer and sugar bowl are in the Dewdrop pattern. 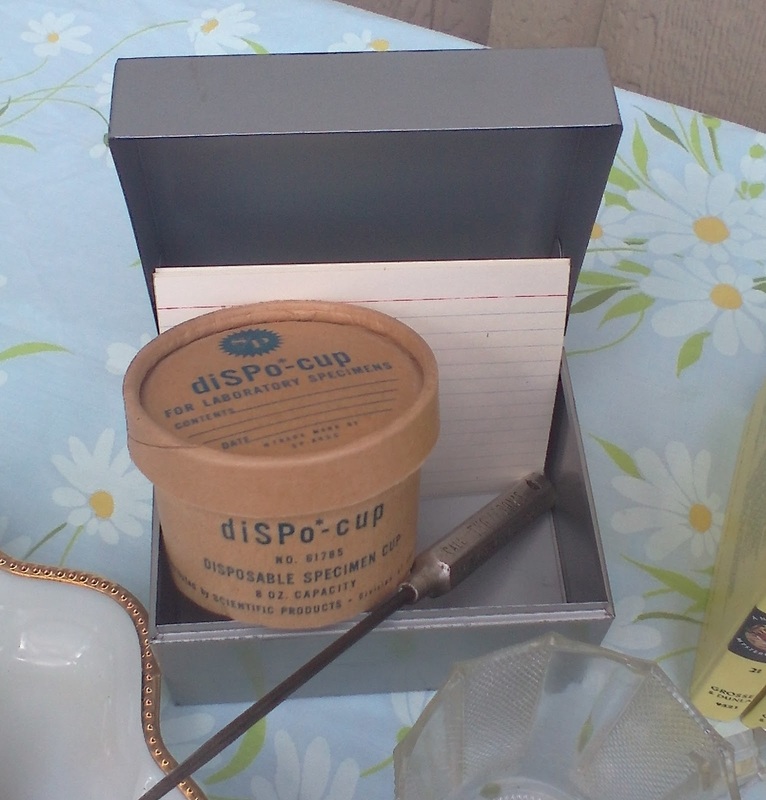 Mom likes recipe card boxes, but better than that are the vintage 3x5 cards. The ones they make today are so thin they are worthless. Dad found a metal stabbity thing (Yes, that's a word. I made it up myself.). It's an ice pick with some advertising on it. Mom's favorite find is that little cardboard box. It is a disposable specimen cup - weird, but that's why she likes it. They also got me all this jewelry (not counting the ones I already showed you) for $3.25. 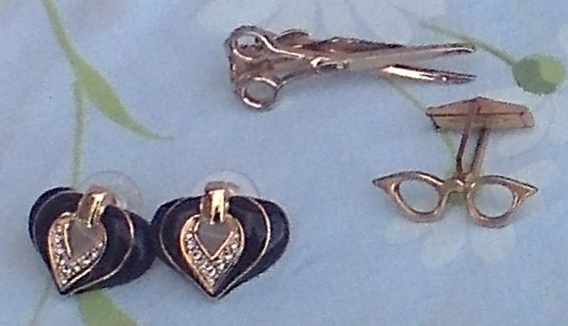 Most of it is just jewelry to take apart and use for other things but a few things are especially nice. 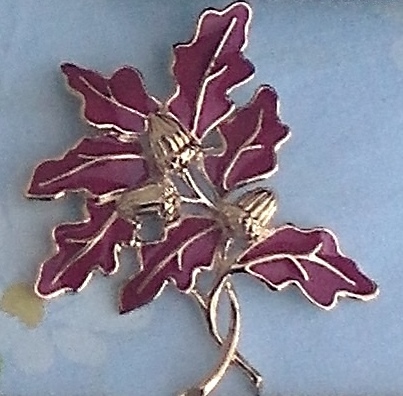 This is an enameled Trifari brooch that sells for as much as $15 online and I think it's lovely. 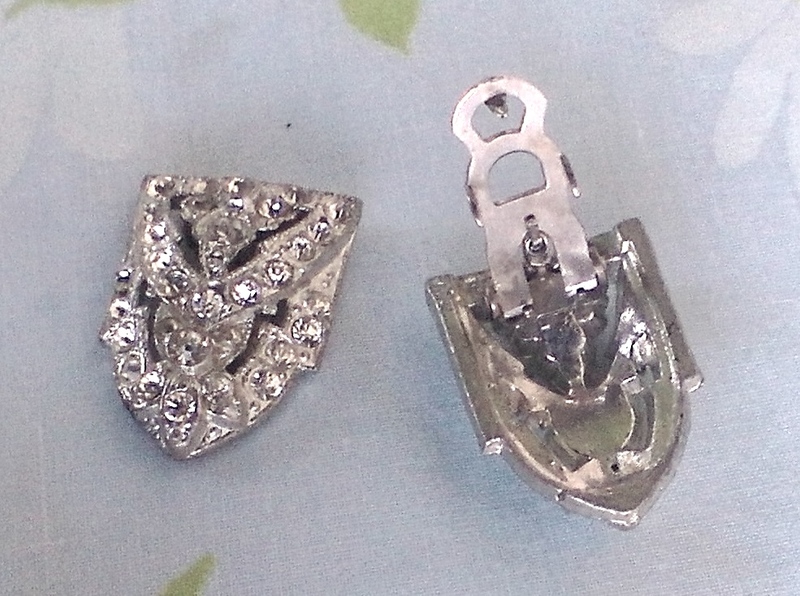 It will hopefully make a great shawl pin. 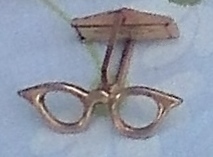 I am very much in love with the glasses cuff link and wish there had been a pair so I could use it as a sweater clip. The black enameled earrings will become a sweater clip for sure. We're happy with our finds, but I don't think we'll be attending any more Estate Sales run by this company. It's just too much work. August was a great month for Estate Sales. 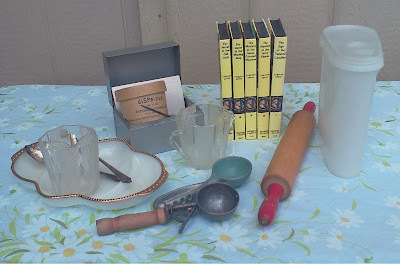 There were several to choose from each week, and Mom and I were able to find quite a bit of useful and interesting stuff. We went to the first sale of the month on Sunday when everything was 50% off. Mom picked up some everyday stuff like measuring spoons and Tupperware for next to nothing. 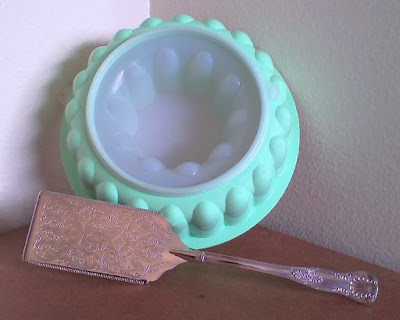 I found a Tupperware Jel-N-Serve ring mold for $1.00 and a silver-plated cake server for 50c. I've had the ring mold on my wish list for some time. It unmolds much more easily than the aluminum ones and is very easy to take to picnics and parties. 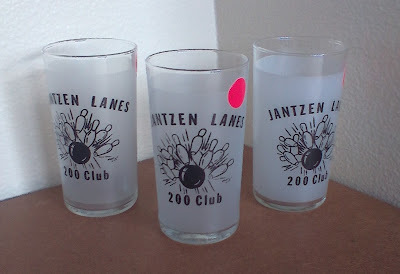 They had a whole shelf of these bar glasses from a defunct bowling alley, and I would have loved to have taken a dozen, but they wanted $2 each, even at half-off. Fortunately they accepted my offer of $6.00 for half a dozen, so I was able to bring some home. 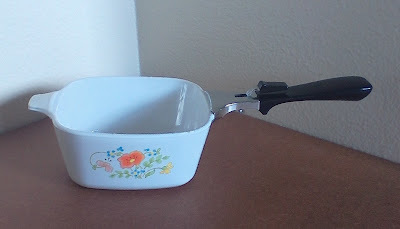 Mom bought this Corning petite pan in the "Wildflower" pattern for 50c mostly because it had the handle. Isn't it cute? 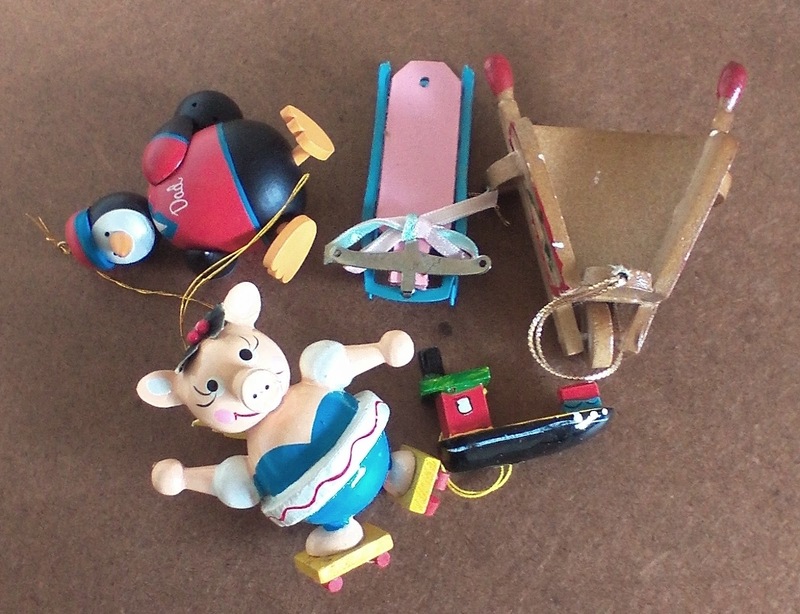 These wooden Christmas ornaments were 50c and will go to the gardener, roller skater and bowler in the family. 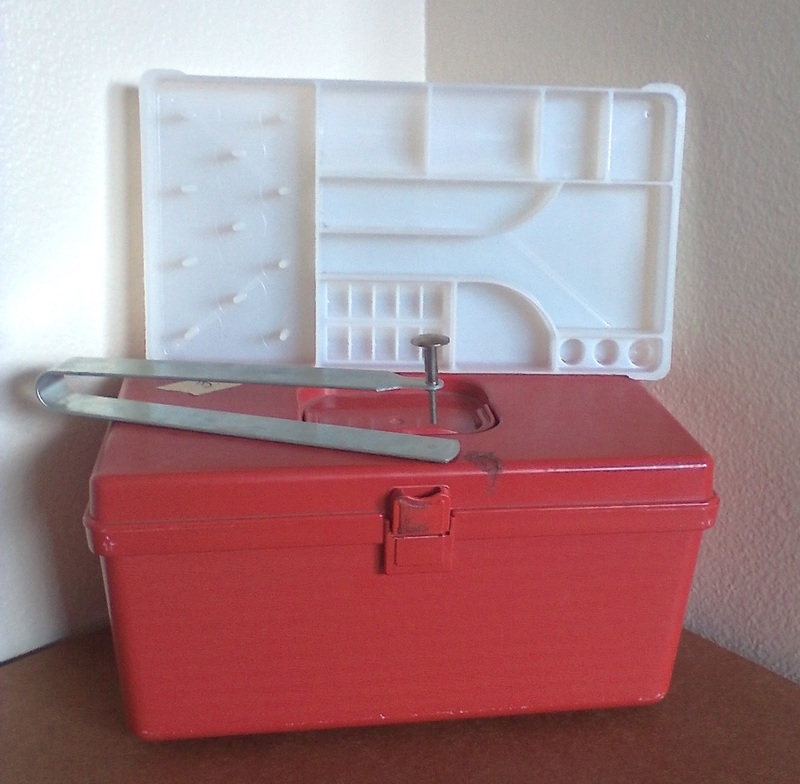 We were surprised to find this vintage Wil-hold sewing box with it's tray for $1.50. Sewing boxes usually sell on the first day. We also bought the metal contraption. I don't think the sellers knew what it was. We certainly didn't, but it was interesting and only 25c.. It was marked "Tack-It" and when we looked it up online it turned out to be a very handy tool for marking fabric. 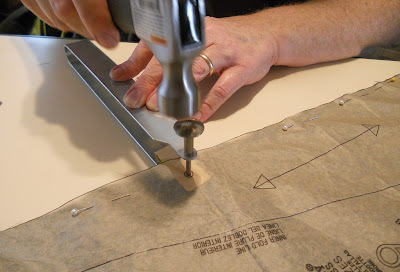 Here's a picture of Mom using it to mark a dot on a skirt I've been sewing. 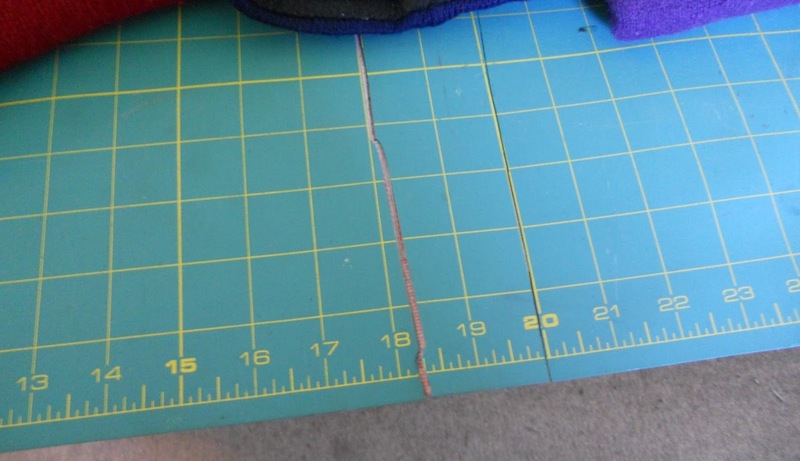 She folded a little piece of tracing paper around the fabric, and then slipped the base under the fabric and lined up the bolt with the dot to be marked. Next, she held down the bar and smacked the bolt head with a hammer. Voila! Both pieces of fabric were marked perfectly. It's a wonderful tool. If you ever run across one at a sale, grab it. A few weeks ago the folks were running errands around town and stumbled upon a small family-run Estate Sale. So Mom gave me a call, and I got to do some shopping by proxy. 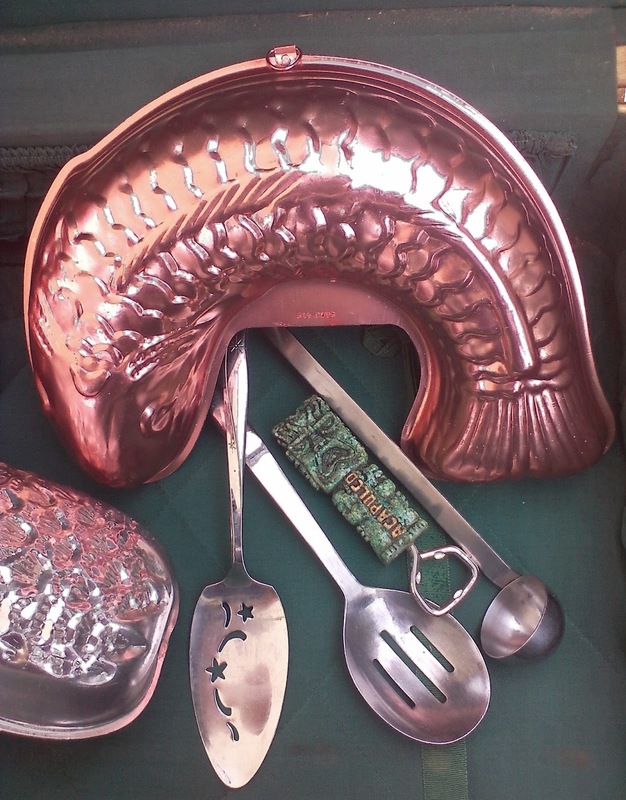 First they found a pile of copper and pink aluminum jello molds. I added 2 pineapples, a bunch of grapes and a fish to my collection. 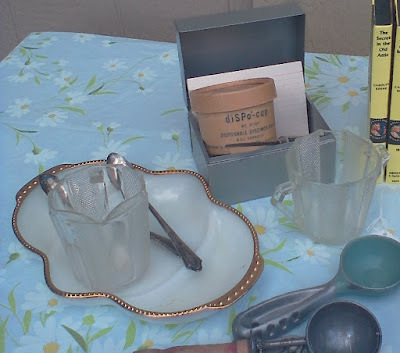 Then they dug through a big box of 25c kitchen utensils and came up with a twinkle star cake server for my collection, a fun souvenir of Acapulco bottle opener for my barware collection, a ladle, and a slotted spoon, both made in Japan of stainless steel and a quality you just don't find today. They brought everything home in this beat up suitcase. As you can see it had a piece of duct tape wrapped all the way around it. It came off, but now the suitcase really needs to be cleaned and painted. Then Mom would like to try transforming it into a table. I had never heard of Skyway Luggage before, but they've been around since 1910 and are still in business today. 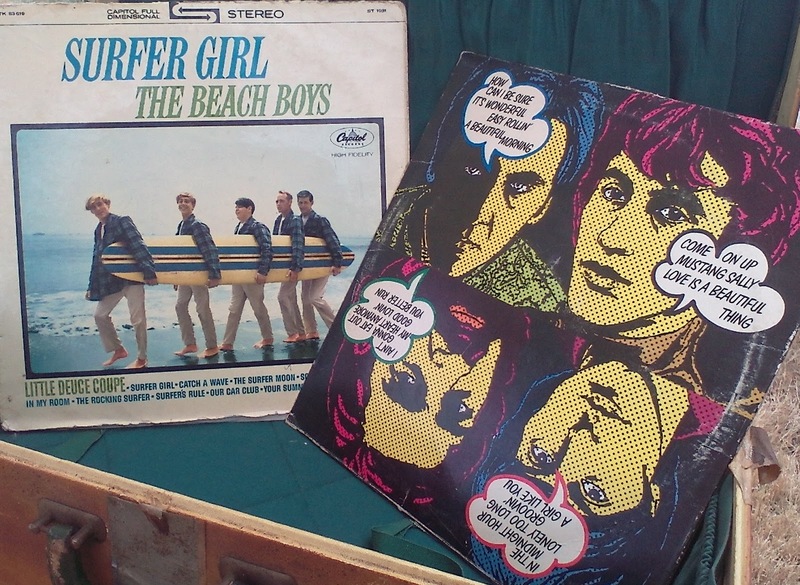 There was a stack of LP records for 50c each. Several of these were brought home for the purposes of cutting up the cases and crafting with them so the discs were not checked for damage. 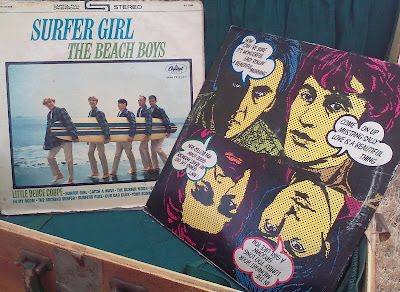 The Beach Boys are in my top 5 favorite bands of all time so that album, even in falling apart condition, was a definite yes that Mom didn't even have to ask me about. 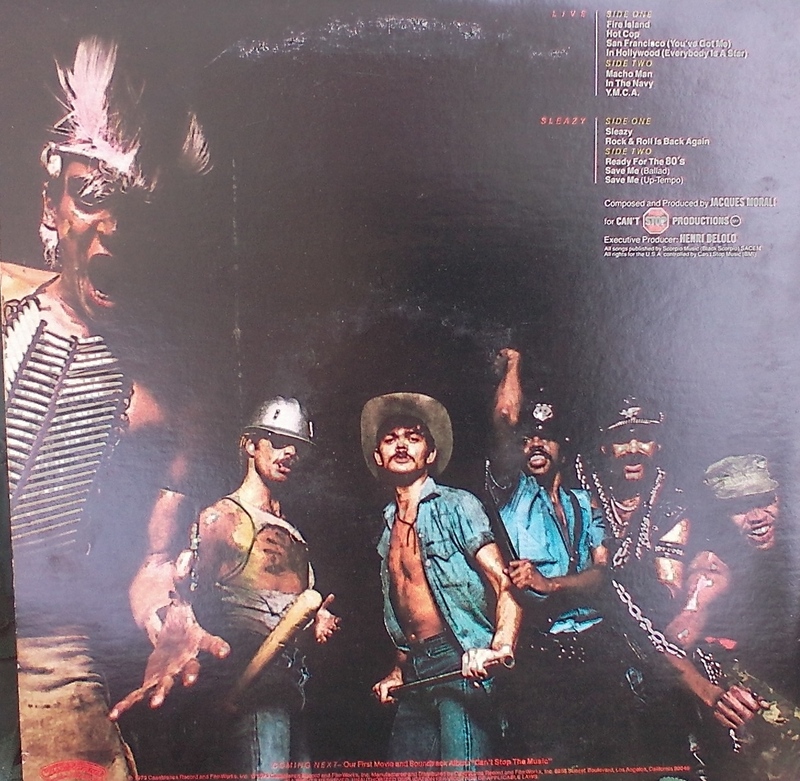 I love the pop art style for the cover on Time Peace. 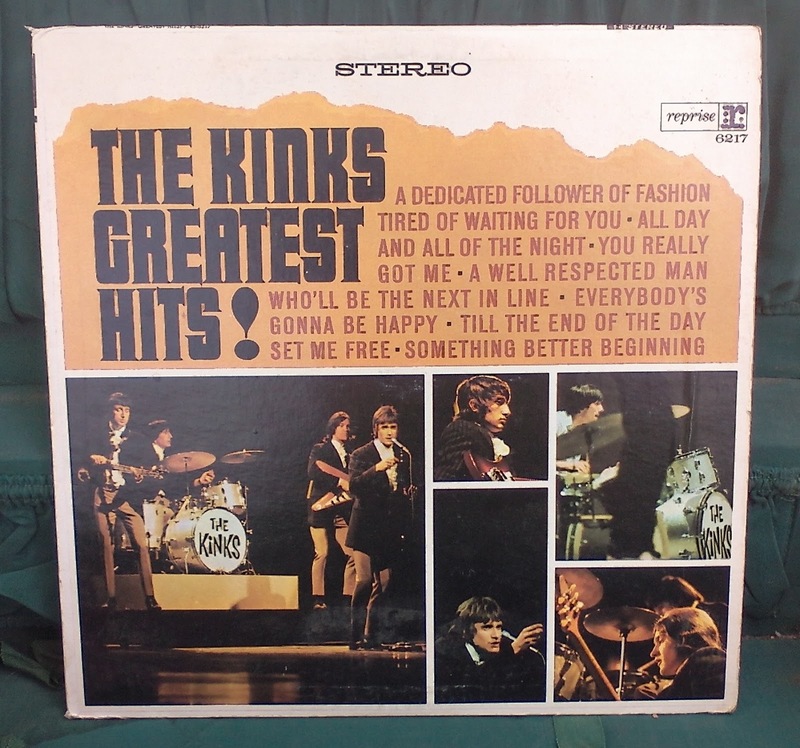 I really like the photo collage on this cover and I'm hoping to try my hand at making a bag of some kind with a clear vinyl sleeve on the side to hold a record album cover. I'm not a terribly big fan of The Village People and why they were put together as a band but they are a great example of cheesy disco era marketing. 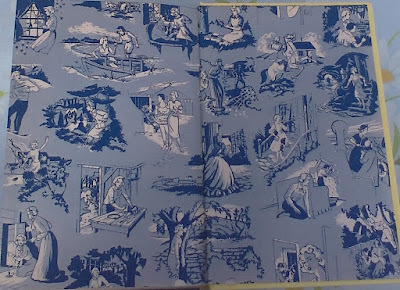 I've been keeping an eye out for these Disney story albums for years as I would love to have a collection. 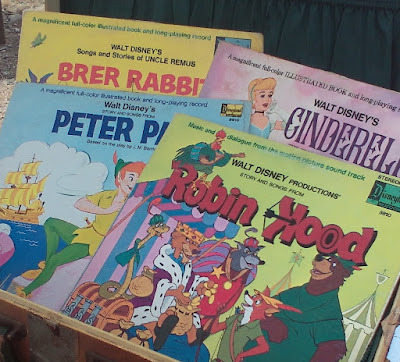 The discs appear to be in decent condition even if the covers are all kinds of beat up (like poor Snow White). Robin Hood was the greatest find as it is my single favorite Disney film. My mother has a collection of record sets that includes some Gilbert and Sullivan music and a fairy tale story record. On that fairy tale record is a version of the tale of Sleeping Beauty that gave me the heebie jeebies as a child because they actually have Maleficent cackling. Only once did my sister attempt to use that in place of a bedtime story and I'm sure she regretted it because she had to share a room with me. 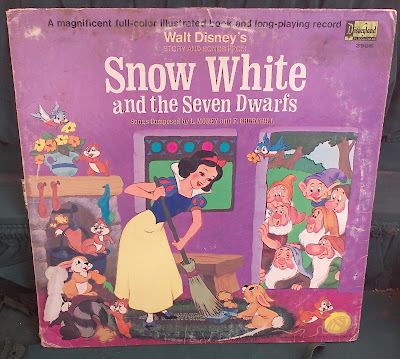 Snow White is the most beat up of the story albums with spotting, wear marks and several missing story book pages so I am hoping that the record plays well. If not, I have something for a fun record bowl! I am a twenty four year old female who enjoys thrifting, Judy Garland movies, classic musicals, pillbox hats, dinosaurs, and pyrex bakeware. I am trained in the art of floral design with an emphasis on weddings. I spent six months a few years ago on College Program at Walt Disney World and enjoy helping people plan their Disney vacations.